Citation: Erowid. "Testing Gymnopilus luteofolius". Erowid Extracts. Jun 2008;14:2. At the December 2007 annual Fungus Fair held by the Mycological Society of San Francisco, volunteers brought in some nice dark rust-red samples of Gymnopilus luteofolius that they had collected in Marin County, California. These samples were positively identified as G. luteofolius by several mycologists in attendance. We received informal comments that it was a weakly active psilocybin-containing species of mushroom and the specimens seemed to show evident bluing. A brief literature search showed that little analysis has been done of this species and we found no analysis of samples from the west coast of the United States. We received a recommendation for Central Valley Toxicology (CVT) as a laboratory that could do analytical testing of the mushroom to determine whether there was any psilocybin or psilocin present. We submitted two small cuttings to CVT, one from the cap and one from the stem. Using methanol as the solvent, they tested the material with LC/MS (liquid chromatography/mass spectrometry). 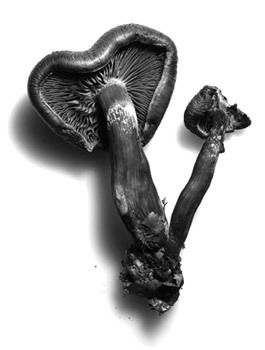 The lab reported that they found no detectable levels of psilocybin or psilocin in the Gymnopilus luteofolius samples and described their testing sensitivity as "down into the picogram level", meaning that they would have been able to detect psilocybin or psilocin even if the amount present was less than one billionth of a gram. Based on these findings, we are able to say that the Northern California sample of Gymnopilus luteofolius was not psilocybin- or psilocin-containing.